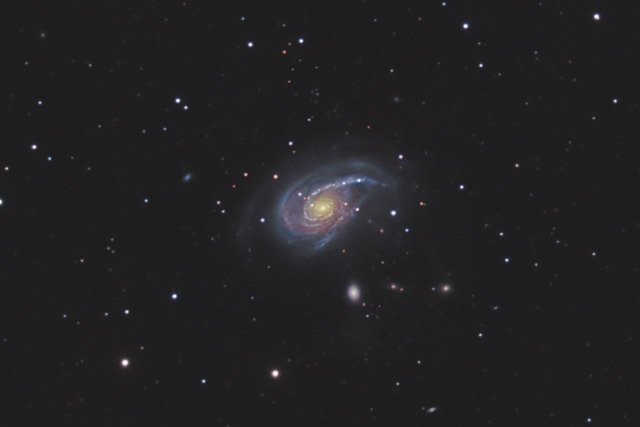 NGC 772 is a fascinating galaxy that is also known as Arp 78. 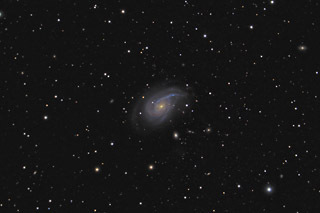 Because it is very close to and gravitationally interacting with NGC 770 (the elliptical galaxy immediately below NGC 772), the spiral arms and shape of NGC 772 are distorted. Additonally, this field has a great many smaller galaxies. In the original TIFF image, I can identify 15 objects which are obviously galaxies and many dozens of faint galaxies scattered throught the image. As an example, close inspection of this photo will reveal a collection of about 13 very small galaxies just above the main galaxy (they look like small spots above NGC 772). In this image, North is Up. This image is cropped to 37% of the original full frame. Software Used Images Plus 4.5 for camera control, calibration, stacking, digital development, multiresolution sharpening, smoothing and noise reduction. Photoshop CS5 used for levels and curves, selective color, high pass filter, star shrinking, lab color, saturation adjustments, screen mask invert, lens correction, and smart sharpen. Gradient Xterminator for gradient removal. Carboni Tools for additional saturation adjustments, noise reduction, and smoothing. HLVG for additional color correction. Registar 1.0 for stack alignment. Notes This is the second year I've imaged this object. Its a great galaxy, and I'm happier with this year's version (although last year's version was a good image as well). This year I captured more total exposure time and used my DSLR-LLRGB workflow to process this image. I think the result was a smoother image with some finer detail.